Bed alarms are monitoring devices that detect sudden movements, or when a person tries to get out of bed, and sounds an audible alarm. Bed alarms for the elderly are especially useful for a person who is at risk of falling, or who is prone to wandering during the night. They also provide reassurance to other family members or carers that the person is safe at all times whilst in bed. They have a thin pressure sensor pad which fits under the user’s bed sheets, or can be placed on the floor. As the name suggests they are activated by pressure on and off the mat. The sensor mat is ideal for an elderly person at risk of falls, someone with dementia or special needs, who is being supported at home by a family member or carer. The padded mat can be set to activate the alarm either when pressure is taken off, for example when a person gets off the bed. or when pressure is applied to the mat when it is on the floor. Requires no installation – the sensor mat can simply be plugged into the monitor unit. 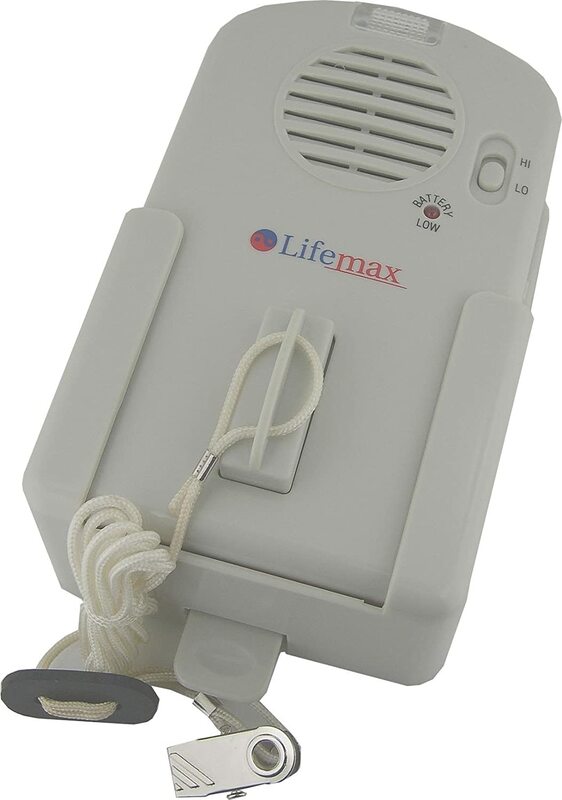 The voice alert monitor comprises of an alarm unit and a length of cord which clips to the user’s clothing. 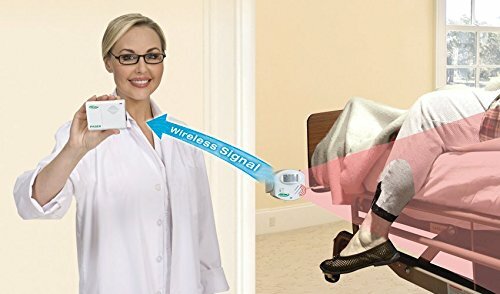 The alarm is activated when a magnetic connector piece attached to the monitor is pulled away, when the user falls out of bed or gets up. The alarm unit has 4 different audible sounds but can be customised to record a 20 second voice recording of a familiar family member or carer. The benefit of this is the ability to have a calming effect on the person, without causing any undue stress. Also, a familiar voice may ask the person to go back to their bed or room. 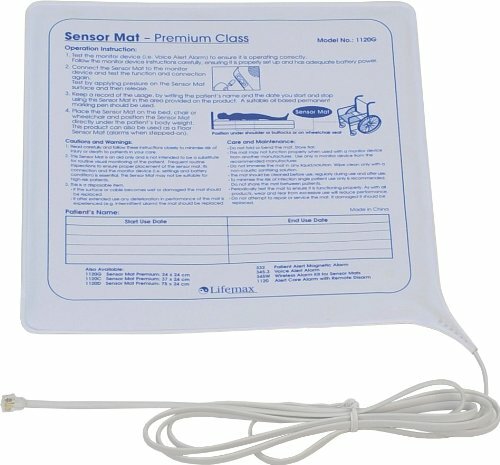 Both the sensor mat and voice alert monitor can be bought and used together as part of an effective alert and falls prevention system, and comes with a 1 year guarantee. Both are simple to set up and use. Infrared light is used to monitor movement by the user and triggers an alarm sound when the infrared light is tripped. The motion sensor alarms are normally set up near the user’s bed, often attached to furniture or a wall. 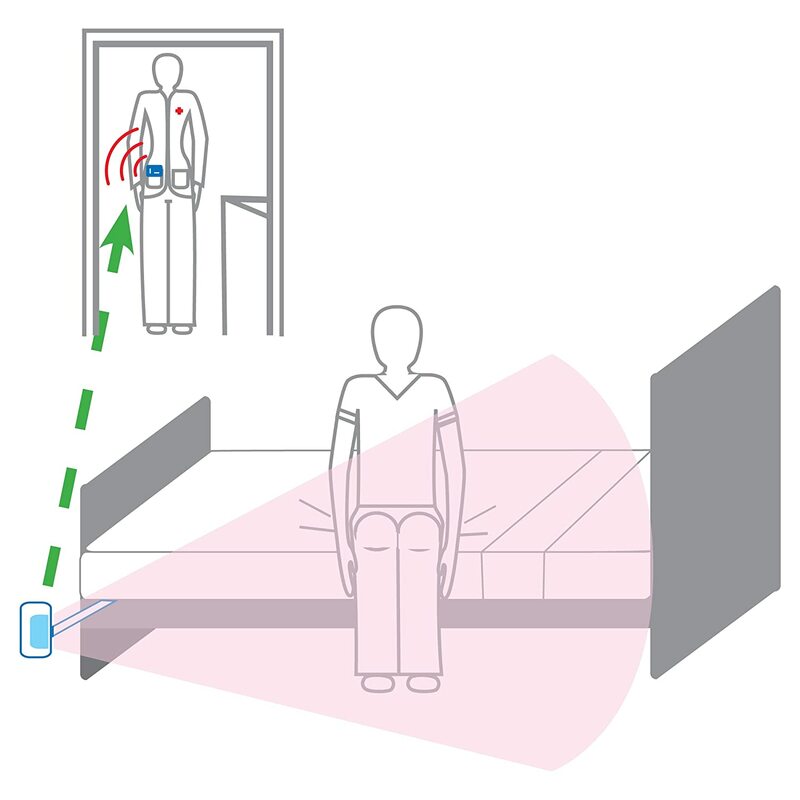 The infrared motion sensor is triggered when the user crosses the motion sensor’s field (when they start to get out of bed or move away from the bed depending on where the sensor is set). A signal is sent to the pager which could be placed on a table at the side of the bed (if staying in the room of the user), or worn by a family member or carer in a separate room. This consists of a cordless alert monitor and bed sensor with the pager/alarm able to be set up 100 feet (30 metres) from the motion sensor. Ideally the bed sensor mat should be placed so the user’s bottom is covering it. When the user sits up and transfers their weight ready to stand the alarm will be activated. This ensures that you get an early alert before the user gets up and possibly falls. Here is one of the best quality wireless / cordless alarming floor mats with remote alarm for bed or doorway. The floor mat attaches to the high quality alarm monitor by the cord which is approximately 6 feet (188 cm) long. When the floor mat is stepped on, the alarm will sound, alerting the carer. To silence the alarm, simply press the reset button on the front of the alarm. As with all the products the main concern is ensuring that our loved ones, who are at risk of wandering whilst in bed, and are at high risk of falling are protected at all times. A bed alarm for the elderly person, often with some form of dementia or cognitive impairment, and who are particularly at risk of falls, provides piece of mind for both other family members, or carers at all times. My role as a physiotherapist, particularly whilst working on a hospital ward, or residential and nursing homes, has brought me into contact with many different patients at risk of falling. 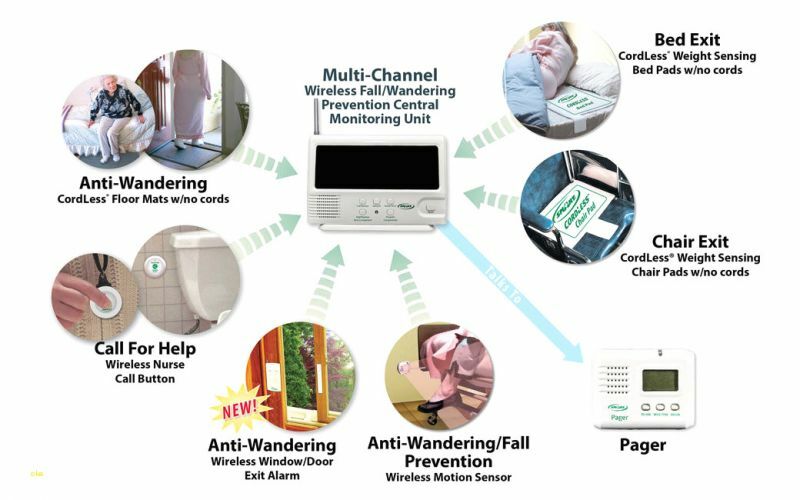 Many have falls alarm monitors fitted to them as they were at high risk of falling when either in bed, or sat out in a chair. The alarms provided an excellent safety mechanism for them at all times. I would be happy to hear different people’s experiences and perhaps offer any help or advice on the subject or related topics. Please feel free to leave a comment or feedback below. Thanks for the feedback Jo – I’m sorry that you didn’t find the information sooner. 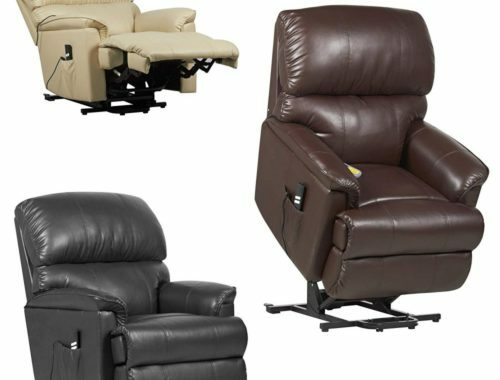 I have found this site very interesting so much detail ,pictures and information , I didn’t realize there was so much technology to support someone to stay in their own home . Elderly people are more vulnerable through the night this site shows what technology is out there . Great site I would highly recommend having a look . Thanks Dot I’m glad you found the information useful. Very good post Mark! I really liked the information you provided. I am gonna have wireless bed sensor for my Grandma. Highly recommended!! Thanks, I hope it’s of benefit to her. Wow! Never knew there were so many viable options for our elderly. I was speaking with a friend of mines the other day who spoke of his wife’s mother having issues with falling. I will certainly pass this info along to him as a option. Thanks Terencio, bed alarms is just one small part of helping the elderly lessen their risk of falling. Thanks for the info Mark! As my parents get older it is good to know there are so many ways to help them keep living life! Hi Kat, I’m glad you found the information useful. 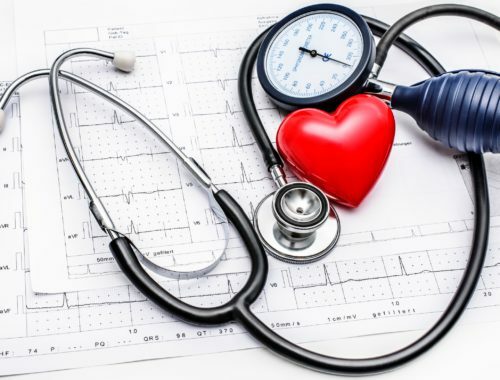 Very detailed information on care for the elderly. I have an aunt who has an aunt who has Alzheimers. This is especially helpful for someone like her as she needs more attention now that she doesn’t remember where she is at times. 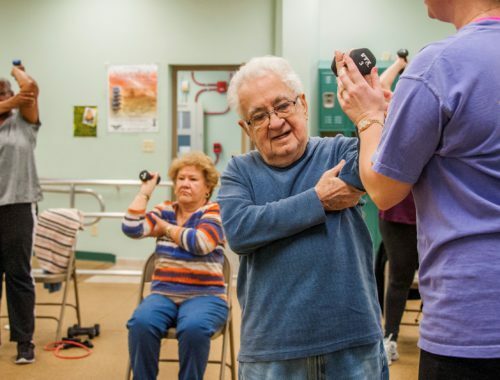 This technology helps the family and caretakers to care for those elderly in need. Thank you for the info. wandering during the night. They offer piece and mind to both carers and family at all times.